Just after my last post I realised another one of my wedding photography images from Stoke Park Club in Buckinghamshire had been awarded Highly Commended in the Wedding Avant Garde Category in the March 2013 International Wedding Image awards, to get one image awarded Highly Commended was amazing to get a second in the same month was a huge bonus and I was delighted to be a stoke park club wedding photographer getting this award for an image I really liked from the days selection. The August 2012 wedding of Laura & Glen took place at one of my very faourite wedding venues in the UK and one where I am highly honoured to be one of a tiny selection of recommended exclusive wedding suppliers the team there promote. The couple had the most amazing day (watch for the full Blog post soon) from one of only two outside ceremonies that went ahead at Stoke Park Club in 2012 (the other being in May) and they are a super couple who were brilliant on the day, the weather was actually very good but I felt a bit of brooding post production and the sparing use of the 15mm fisheye lens lent this image a sense of brooding drama. 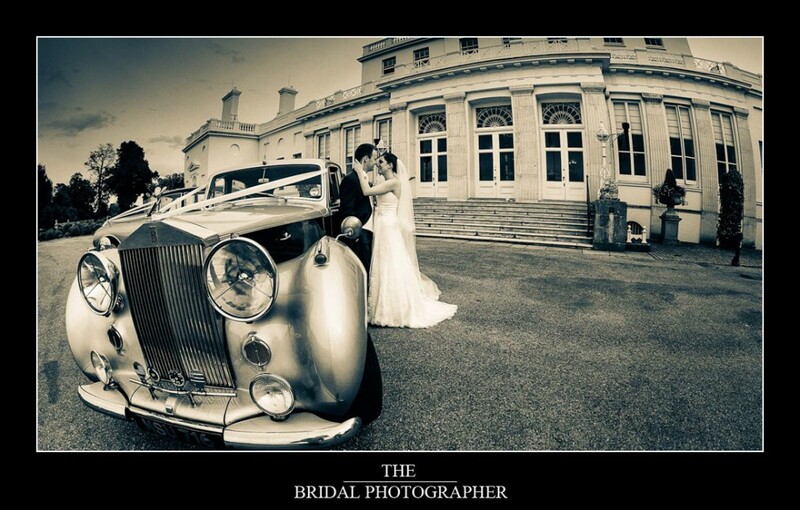 It was treated as a film image would be and I used the film qualities of my favourite black & white film I used to shoot on Agfa with it’s lovely grain structure showcasing the vintage rolls car, the couple themselves and the Manor club house at Stoke Park Club.